Yummy food, yucky laughs and pictures by the Aliens Love Underpants artist. Lip-licking good. Nora Fatima Buffet is a total greedy-guts. One night she decides to make her own sandwich, using whatever she can find. Clothes, toys, forbidden treats: she’s piling her plate high. But is she biting off more than she can chew? Perhaps you don’t want to try Nora’s bizarre sandwich. We don’t blame you – but this is one book you’ll love tucking into! very funny and utterly ridiculous! This book is funny, silly and absolutely hilarious! 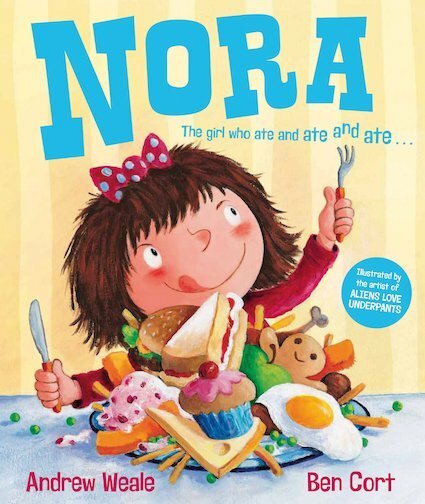 I really enjoyed Nora the girl who ate and ate and ate. It`s about a girl called Nora who couldn’t stop eating! When she got sent to her room without tea, she ate all of her toys in her room. My favourite scene was when Nora burped because loads of food came out, they looked wierd and disgusting as she had eaten them ages ago! I also enjoyed the part when she was on the moon with no food, or was she? Everyone knows the moon is made of cheese! Don`t they? It was really good but it was not the best book, 8/10, Although I thought the pictures were really funny!